From you comes my praise in the great congregation; my vows I will pray before those who fear him. The poor shall eat and be satisfied; those who seek him shall praise the Lord. May your hearts live forever! All the ends of the earth shall remember and turn to the Lord; and all the families of the nations shall worship before him. For dominion belongs to the Lord, and he rules over the nations. To him, indeed, shall all who sleep in the earth bow down; before him shall bow all who go down to the dust, and I shall live for him. Posterity will serve him; future generations will be told about the Lord, and proclaim his deliverance to a people yet unborn, saying that he has done it. “How can we get young people to worship?” I get asked this question all the time. Because I am young and involved the church, many assume that I have the secret to unlocking the riddle of putting younger people in pews. The truth is, I have no answer to the question. For me, it is as simple as discovering God in a place and time such as this, and therefore I return week after week because it provides the strength for my own discipleship. I don’t know what to do to get younger people to worship other than doing what we do well. However, some believe the key to growing the church can be found in contemporary worship. The belief goes that traditional worship styles with stained glass sanctuaries, organs, and hymnals, no longer connect with people and give life. So, contemporary services strive for the opposite, instead of traditional church architecture they meet in auditoriums or gymnasiums, instead of stained glass they use projectors and screens, instead of an organ and hymnals they use a rock band and display lyrics on the screen. Many church planters believe this is the future of worship, that if we want the church to grow we have to be willing to let go of the past and embrace the future. Interestingly, many young people are finding themselves drawn to traditional worship, while contemporary services are regularly filled by the boomer generation. Why? What we discover in traditional worship is unlike anything we encounter during the week. Worship is supposed to be different than our daily lives and fill us with God’s grace. I could go on an on about the importance of listening to the organ and singing our faith from the hymnal, but I’ll save that for another sermon series. This month we will take time each week looking at the Stained Glass of our sanctuary and wrestle with how they convey the Good News to us today. The first window contains the mother of Methodism Susanna Wesley. Born in 1669, Susanna was the twenty-fifth of twenty-five children. Her father, was a preacher of sorts who rebelled against the status quo of the Church on England and he consistently encouraged his daughter to study books from his library (against the conventional wisdom). Susanna eventually married Samuel Wesley, a clergyman from the Church of England and gave birth to 19 children, of which only 10 lived to adulthood. Because her husband was often busy with the responsibilities of the parish, Susanna was left to raise and educate the children on her own. They all learned Latin and Greek and were well informed in classical studies. The image in our window shows Susanna teaching two of her sons, John and Charles Wesley. She took seriously the need for her children to be raised with a proper education and also put a tremendous emphasis on raising them in the faith. I don’t know for sure why the artist chose this particular representation, but I imagine it has something to do with an episode during her life when her willingness to engage her children sent them on a path that led to a renewal within the church, and eventually a new church. The story goes that her husband was gone in London for a period of time, and a guest preacher was brought into the local parish. After a few weeks of particularly sub-par sermons, Susanna decided to assemble her children on Sunday afternoon for her own services. It would begin with the singing of a psalm, then Susanna read a sermon written by her father or husband, and concluded the worship with another psalm. Word about the services began to spread and people started to ask if they could attend. At the height of her Sunday afternoon services, over two hundred people were attending regularly, while the Sunday morning service at the local church dwindled to nearly nothing. Susanna, like the psalmist, believed in the importance of remembering and returning to the Lord. She took time each week to educate her children, and the local community, about God’s dominion so that future generations would be told about the Lord. Whenever our eyes fall upon this window we remember that we, like Susanna, are called to nurture and teach and love those around us. John and Charles Wesley would eventually grow into the men who sparked a theological revolution. Charles will always be remembered for his hymn writing (all of the hymns we are using this morning were written by him) and John would become the founder of Methodism. This window helps us to remember that we can serve the Lord by sharing the Lord with others. Our words are powerful and they can be the spark that ignites a revolution of the heart. The second window portrays a grown John Wesley during the height of the Methodist renewal movement. Born in 1703, he was raised and taught by his mother and followed a call to ministry within the Church of England. However, John grew disenfranchised with the way the church was being run, he saw pastors who were following a career path rather than giving their lives to Christ. He saw people fighting for positions within the church rather than submitting to the will of God. He saw hypocritical preachers rather than people seeking holiness of heart and life. After a particular string of episodes that left him filled with doubt, John Wesley had his heart strangely warmed during a small service on Aldersgate Street in London. He wrote in his journal: “I felt my heart strangely warmed. I felt I did trust in Christ, Christ alone for salvation: And an assurance was given me, that he had taken away my sins, even mine, and saved me from the law of sin and death.” (The Journal of John Wesley, 35). 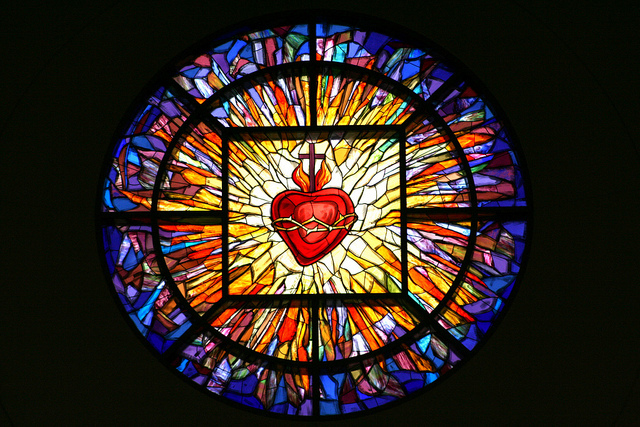 The glowing heart in our window is a reminder of his conversion experience. From that point forward he felt called to spread scriptural holiness of heart and life throughout the lands and helped to form small groups through the country to help disciples grow in love of God and one another. The moment of heart warming encouraged him to see the world as his parish. Rather than being limited to a particular time and place, John Wesley listened to the Spirit’s call and moved according to God’s will. John, like the psalmist, believed in the importance of remembering the Lord’s works even to the ends of the earth. He understood Jesus as Lord and did whatever he could to share the love he experienced in his heart with other people. 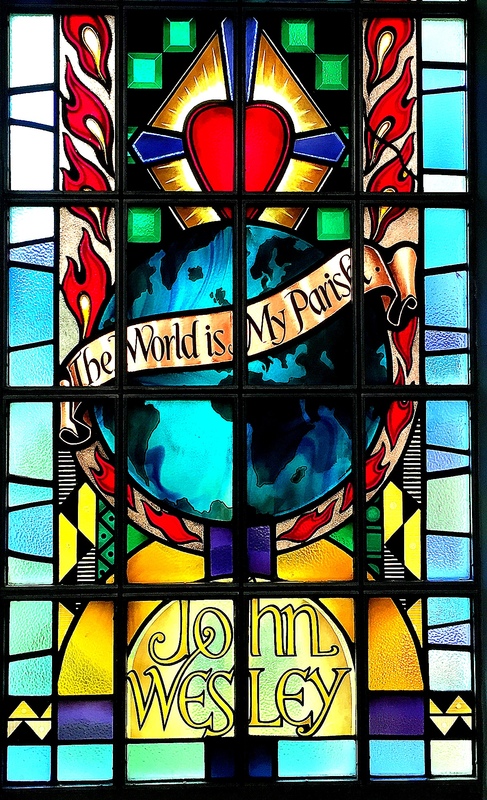 Whenever we take in the beauty of this window we remember that we, like John, are called to feel and experience God’s pardoning and loving nature. Having our hearts strangely warmed is at the heart of what it means to follow Christ and give our lives to discipleship. Yet, once we feel this assurance like Wesley did, we cannot just keep it to ourselves. If it really is something that transforms our very lives then we should be willing to go even to the ends of the earth to help others remember the Lord. The gift of God’s love is something worth sharing with others just like John did. Our words are powerful and they can be the spark that ignites a revolution of the heart. Our third window displays Francis Asbury, the symbol of American Methodism. John Wesley discovered Asbury while a young man in England and encouraged him to become a circuit riding lay-preacher for the renewal movement. He was remarkably successful as a preacher even at a young age. In 1771 Wesley sent lay preachers to continue the movement in the colonies including the young and talented Francis Asbury. However, by 1777, at the height of the American Revolution, all but one, Asbury, would return back to England. For Asbury the kingdom of God was more important than any human nation, and nothing would stop him from following his call. Asbury became the de facto leader of the movement and spent the rest of his life traveling on horse back to spread scriptural holiness. When he arrived in the colonies there were 600 people participating in Methodist ministries. By the year of his death (1816) there were more than 200,000 members (2.3% of the population) making it the single largest Christian tradition in America at the time. Why was he so successful? In our stained glass we see Asbury holding a bible and riding on a horse. He had a strong and fundamental belief that the Lord was calling him to reform the continent, and to spread scriptural holiness over the land. Asbury was willing to go wherever whenever with only the Word of God to guide his words and actions. He traveled so widely across the landscape that at one time he was the most well known man in America simply because of how much he traveled. Asbury, like the psalmist, believed the people were hungry and yearning for something greater than themselves. He understood that if he was willing to bring the Word to the people, that they would feast and be satisfied. He gave his life to the mission of spreading holiness so that people would praise the Lord. Whenever we gaze upon this particular window we remember that we, like Asbury, have a responsibility to help people feast on the Word. Going out and meeting people where they are is fundamental to the kingdom of God. If we are content to just wait for people to show up with their questions and hopes, then we will be disappointed. 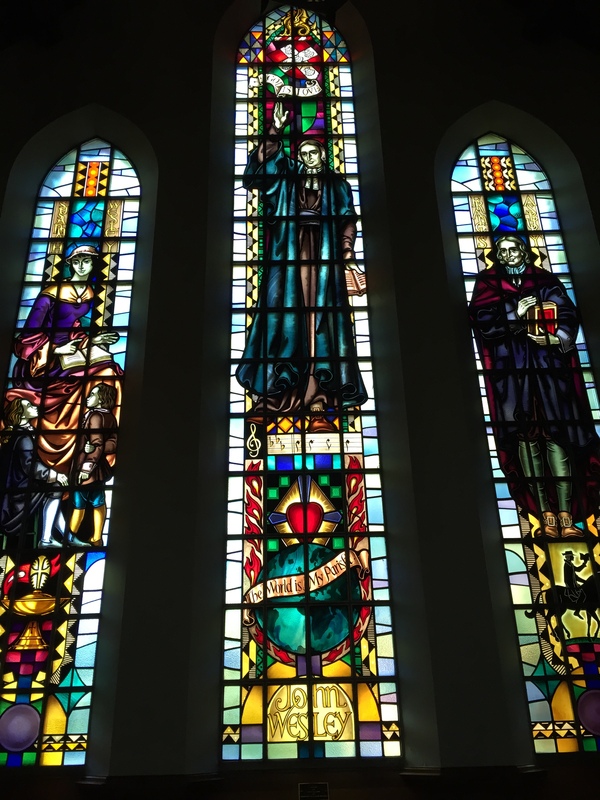 This window gives us the encouragement to give of ourselves for other people just like Francis Asbury was willing to do. The gift of God’s grace and mercy is something worth sharing so that others might feast and be satisfied. Our words are powerful and they can be the spark that ignites a revolution of the heart. 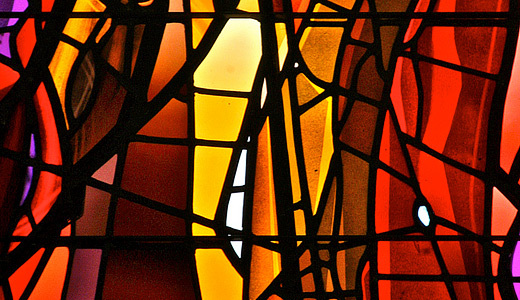 What we do in worship, how we understand discipleship, and even why we gather for communion was largely determined by the three Methodists in our stained glass. From Susanna’s Sunday afternoon lessons, to John’s heart-warming experience, to Asbury’s commitment to mission of God, we are who we are because of what they did. However, if we call ourselves Wesleyans or Methodists, it is fundamentally important to remember that we are first disciples of Jesus Christ. These three Methodists followed Christ and their lives were results of their discipleship. It was through their reading of scripture and persistent prayers that they started a revolution within the greater church and brought the Word to people to tell them about the Lord. When we come to gather at the Lord’s table in a few moments, let us remember that Susanna, John, and Asbury all gathered at a table such as this to feast on the Lord and receive the strength for their discipleship. Wesley in particular believed in constant communion, doing whatever he could to experience the Lord’s grace at all times. If you want to know God’s grace and love, look no further than this table. But after we feast, what shall we do? Shall we return to the busyness of our lives and forget the importance and value of finding holiness? Will we limit the power of the Lord to Sunday mornings at 11am? Or will we take the bread and cup and let it nourish our souls for the work of discipleship? Will we pray fervently for the Lord’s will to be done? Will we go out into the world to tell future generations about the power of God? Now is the time for a revolution of the heart. Amen.